every week, as i settle down to do this thing, i make a solemn oath to keep it brief. 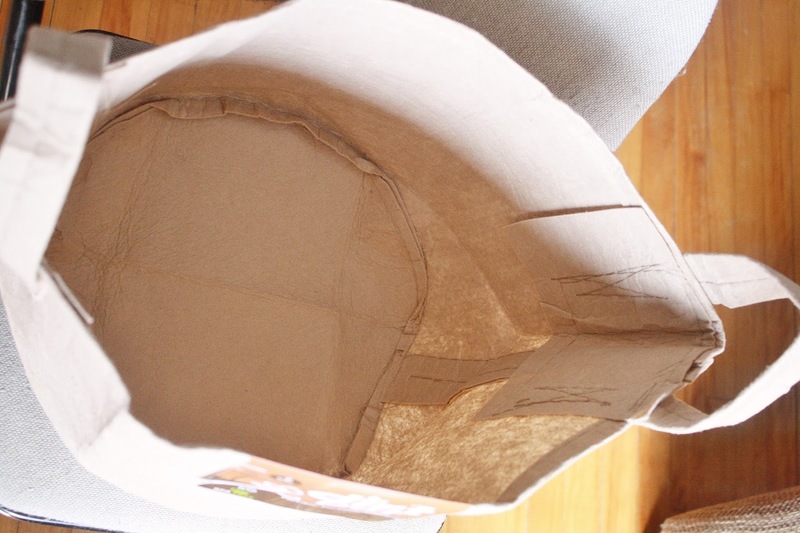 one or two (short) paragraphs of text, brief mention (or photo) of some crafty thing in progress, brief mention (or photo) of one other random thing that has happened in our very static lives (a meal, a trinket, kitty antics, etc. ), then bid you a fond adieu and disappear back into my fortress of solitude... then i realize two, three, or more hours have flown by, and i am staring at enough text to bore even the author beyond the point of tears. i am saying this by way of apologizing in advance—and retroactively—for my inability to be brief. it is a gift and a curse. and, yes... this post will be (mostly) about potatoes, of which there is so very much to say. growing up in a family that viewed rice as the natural accompaniment to every single meal imaginable, i developed a deep, burning love for potatoes and pasta from a young age. fusion cuisine was practically invented in our home. mom would make an awesome Caribbean-style stew or curry, and i would have mine over a mound of spaghetti or spilling out of a split baked potato. fast-forward a couple decades, and imagine my continued dismay at having to avoid pasta most days. enter the humble potato. 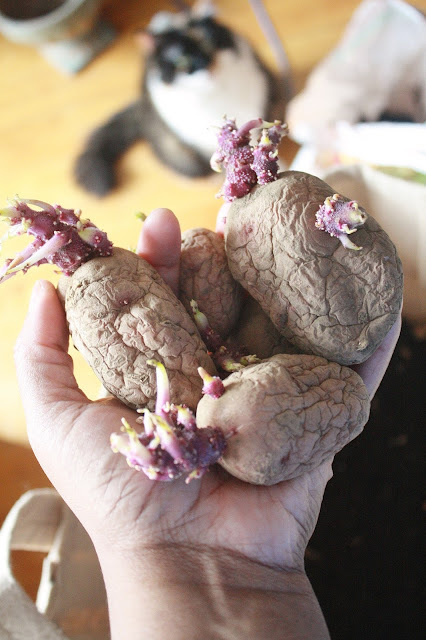 last year's CSA farm share went until late October, and ended with large quantities of storage crops (potatoes, carrots, onions, and the like) to see the members through a decent-sized chunk of the Winter. we had potatoes baked, scalloped, mashed, home-fried, and made into large pots of truly delicious soups before deciding that we needed a break. the remaining spuds were tucked away at the back of a kitchen storage bin (more on that later), and we set our sights on other ingredients. there may have even been a slight increase in the number of meals containing rice, but i am still not a fan of the stuff. then, about a month ago, i found myself in the mood for a baked potato, so i did the naturally insane thing and purchased a whole bag of potatoes (by which i mean like ten pounds, which is pretty much bulk quantity in a household of two). since then, we have already had potatoes baked, mashed, and home-fried, and there may have been one meal of potato-cheddar soup... or maybe that was just a flashback from some earlier 'trying to get rid of potatoes' experience. at any cost, we are down to less than half of the bag of potatoes, so there will be a few more spud-tastic meals in the coming week, but i can see the light at the of the tunnel. no, really, i can. so, there i was making room in our usual potato storage space for the now-smaller bag, when it dawned on me that there are still potatoes from last Fall tucked away back there. some months ago, when i noticed they were developing rather prominent eyes, i commented that it was a shame that Summer was so far away, or i would plant them (as opposed to throwing them away). 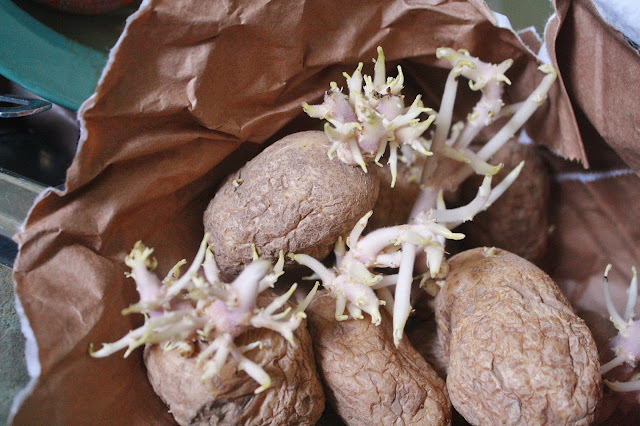 then i wrapped them up in a paper bag and stashed them away in hopes that they would not go to rot before it warmed up... then i totally forgot that they existed. behold... potatoes that have been lurking in the shadows of my kitchen for several months!!! they may look like some new species that was discovered at a previously-unreachable depth of the ocean, but they are perfectly fine for planting. the body of the potatoes have lost their firmness, as most of that substance has gone into keeping those sprouts alive, but there is no mushy dampness or odd smells to suggest rotting. i was so excited by the find, that i almost overlooked the other bag tucked even deeper back in the bin. the red ones are of a mystery variety (they were in a plain, brown-paper bag), while the white ones were in a bag labeled "goldrush", which is a type of russet (the classic baked potato). 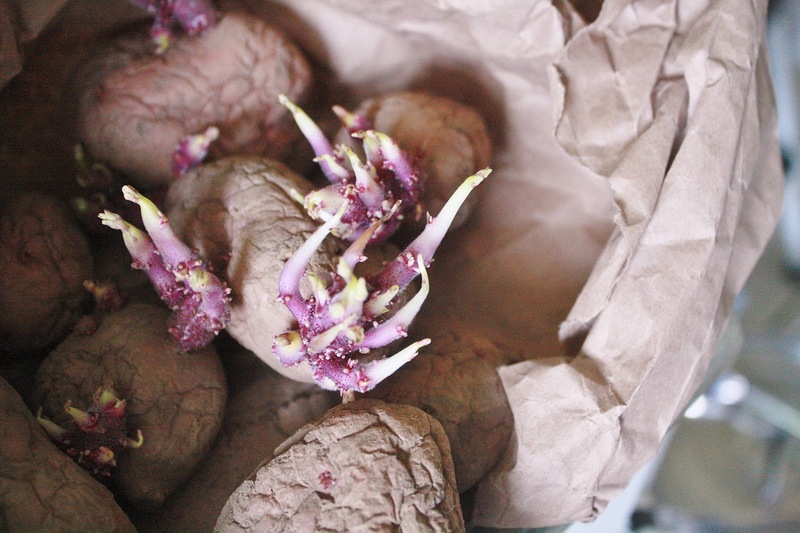 when faced with an abundance of sprouted potatoes—especially, while you are trying to simultaneously get rid of their un-sprouted cousins—the logical thing to do is to grab some soil and get planting so that you will have even more future-potatoes. naturally. potatoes can be easily grown in or out of the ground, just as long as they have good drainage and a loose growing medium. i tend to prefer to grow them in containers, as the harvesting process is as simple as tipping out the contents and using your hands to sort the spuds from the soil. no shovels or pitchforks required, which means no crying over accidental piercings. 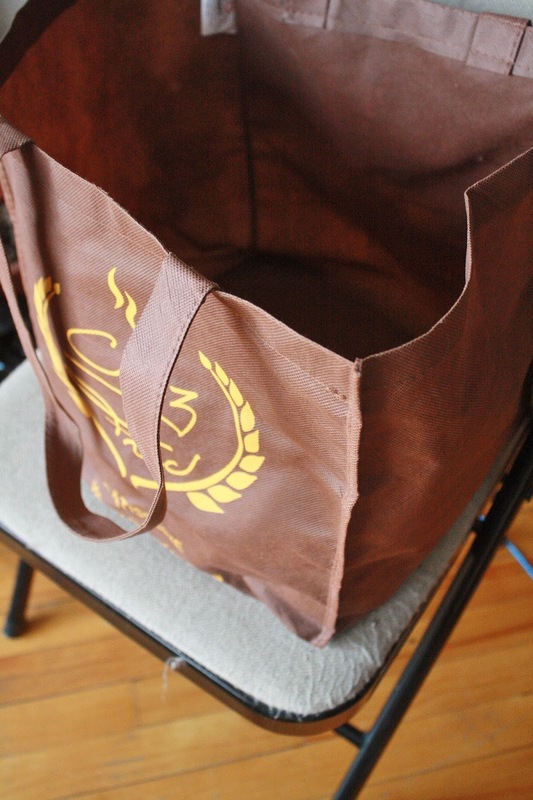 and a recycled, fabric-type bag from the bakery for the russets. why, you ask? because it was there. 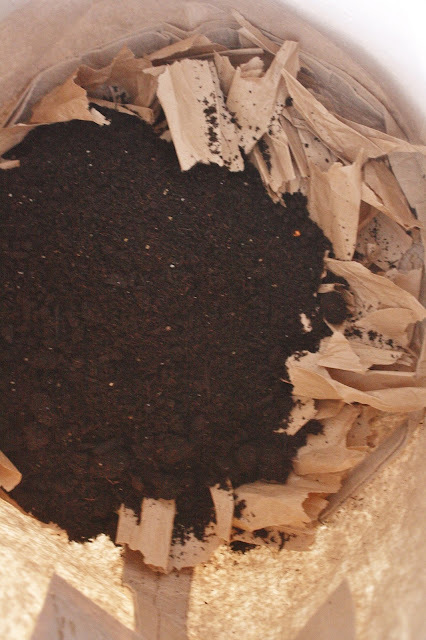 as for the growing medium, i am a big fan of using leaf mulch (all the fallen leaves you rake up in the yard), but that is not an option at present, so i went for potting soil layered with some ripped up packing paper (yes, i still have a ton of that stuff thanks to the atrocious packing practices at Amazon). Mama Kitty is intrigued by the crinkling sound of paper, so she offered to help... in a purely supervisory capacity, of course. 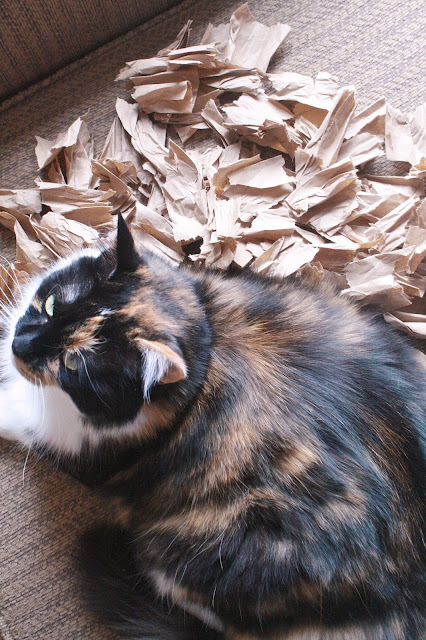 this consisted of laying on half of the paper and ignoring my repeated requests to shove over. 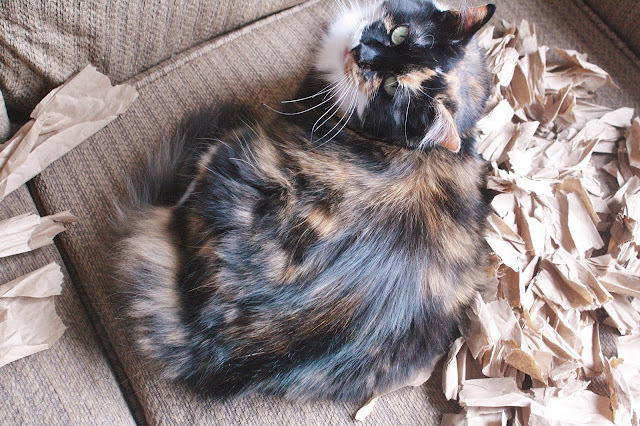 meanwhile, across the room, Baby Bear had to be physically removed from the chair i had placed in that location for the express purpose of not having to bend over too much while getting this done. gee... i wonder where she gets that from. note, i skipped the customary step of cutting the larger potatoes into smaller chunks. life is too short to bother with such things. (note, also, that i was under close observation the whole time). 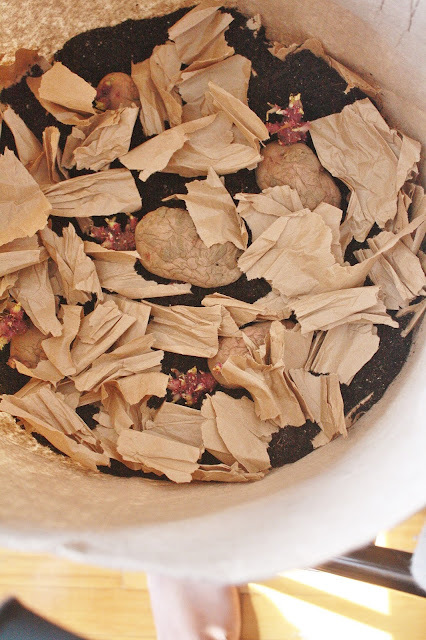 then topped it off with more soil and another dash of bone meal, placed the bag in a large plant saucer, and gave them a healthy splash of water. 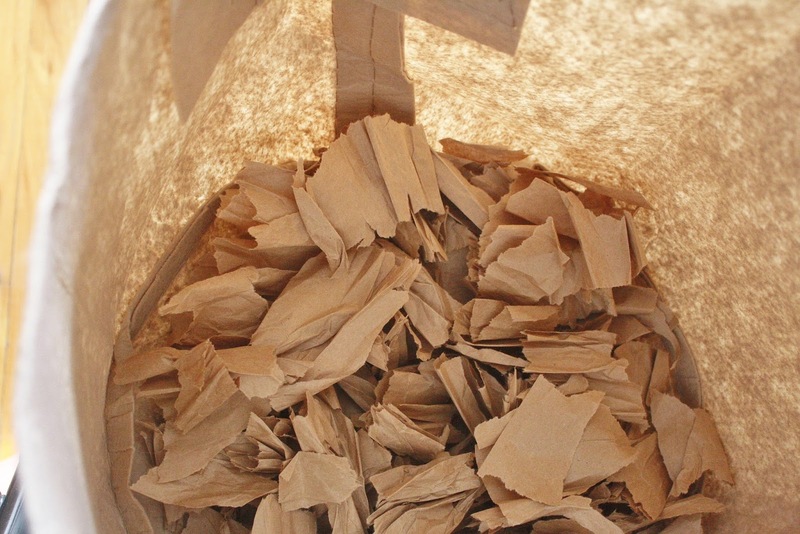 as the plants grow upward, i will periodically cover all but the top layer of leaves with more paper and soil. potato plants send horizontal runners out from the buried stem into the soil, and the potatoes grow along those runners. 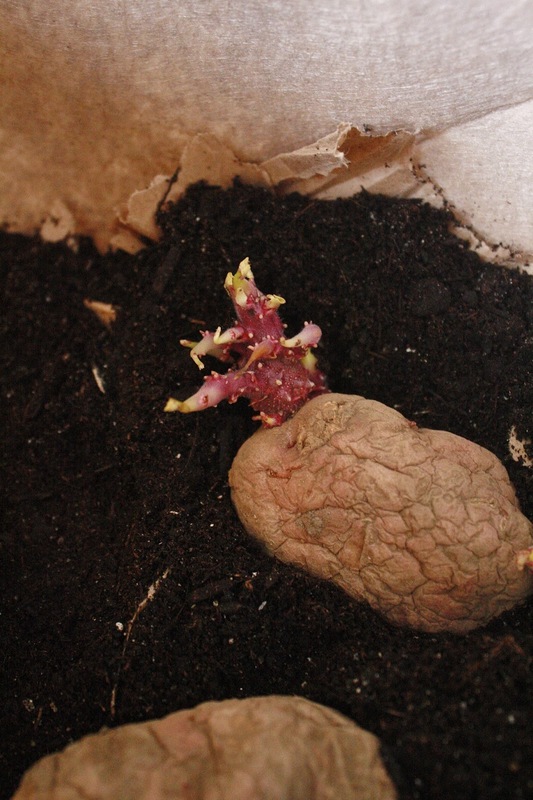 the more stem you have underground, the more surface area you have for runners and, subsequently, for potatoes to develop. 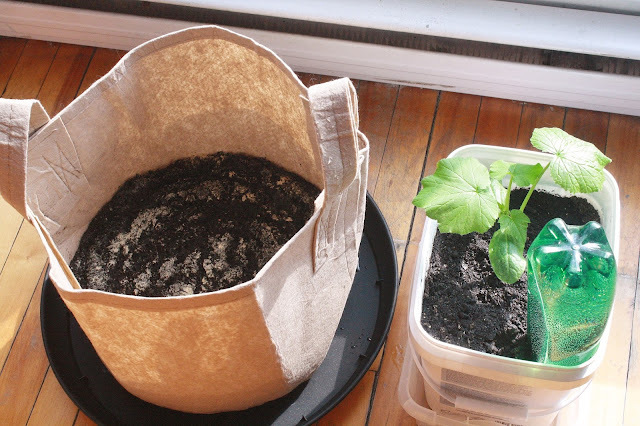 therefore, you start the plant at the bottom of the container, and slowly increase the soil level as it grows. so, why not just fill the container all the way up to the top with soil from the start? excellent question. 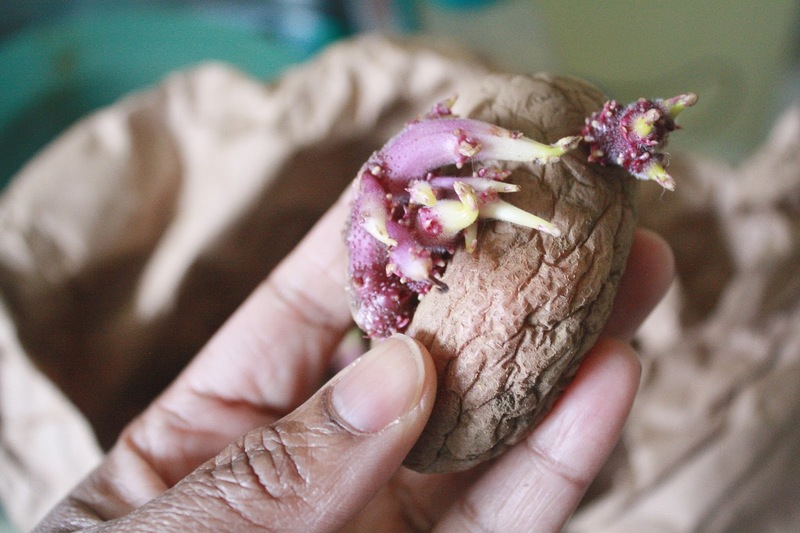 the developing plant—and the withering potato that is providing it with nourishment—would likely rot before the growing ends reach the light. i planted them rather densely, which should result in small potatoes, which is perfectly fine, since we will eventually be deluged with potatoes from the farm. him: between our farm share and the stuff we're growing, we probably won't have to buy any veggies all Summer. at which point, i groaned and realized that i am already sick of future-potatoes. 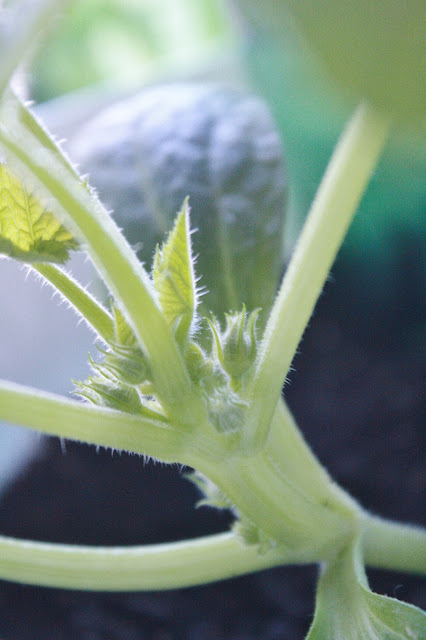 in (tangentially) related news, the zucchinis are still growing like crazy, so much so that they are already forming tons of flower buds. at this rate, we will be feasting on squash blossoms before it is warm enough to transfer the plants to the balcony. 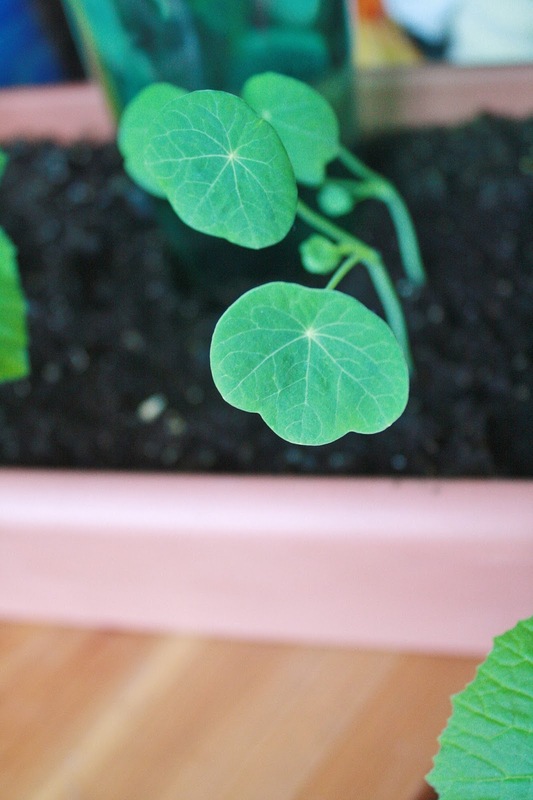 i popped a few nasturtium seeds in between the zukes, and they have proven to be equally aggressive growers. 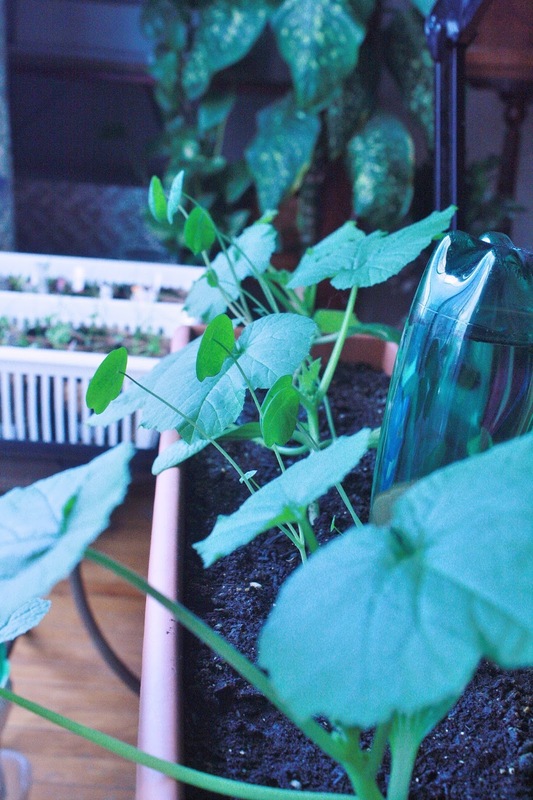 while nasturtiums are edible, i grow them for purely aesthetic purposes. 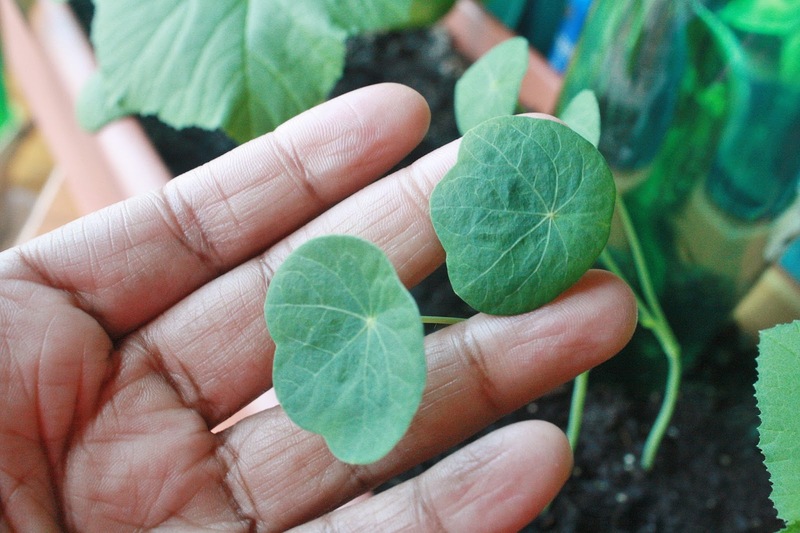 the flowers come in a variety of colors (the variety i planted is called jewel mix), and the foliage looks like a cross between a taro leaf and a lily pad. they are like parasols for tiny mythical creatures. perhaps i have said too much. and on the subject of tiny things... a couple-few weeks ago, i was introduced to the world of mini foods and videos of tiny edible meals created from common ingredients. why? i have no idea. it seems completely pointless, until you find that you have been holding your breath in nervous anticipation at the flipping of a sliver of salmon cooked in a drop of oil or smiling at the precise placement of chocolate-glazing on a donut less than half the size of a Cheerio. it is downright addictive... and contagious to boot. 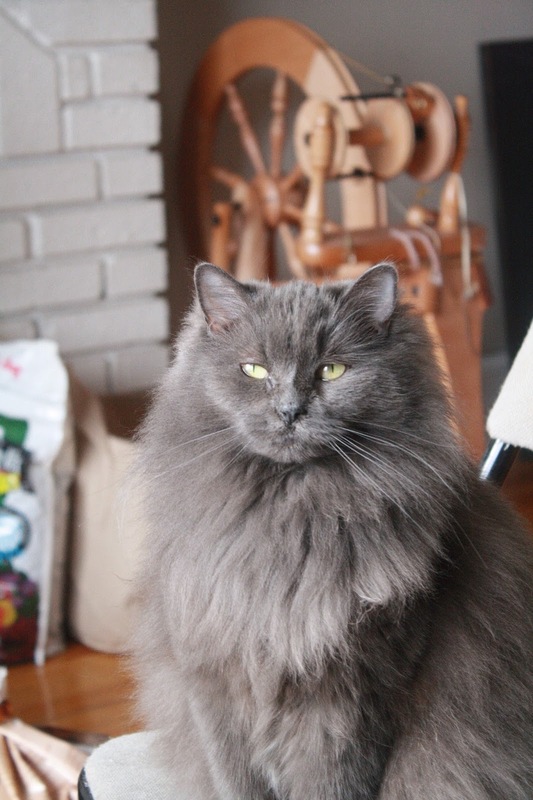 picture the scene: i am seated, cross-legged, on the chesterfield with one kitty napping on the armrest and the other kitty curled up against my thigh. in walks my favorite animator. him: my three favorite girls in one spot. what are you watching? me: videos of people making insanely tiny meals. him: ooh... go back to the guy with the little toys. he has better tiny knife skills. i meant to talk about that yarn i dyed last week... and that package i (still) need to send halfway around the world... and the cardi of white and (gasp) pink... and my frustration with the 24-hour day... and all the other things, but i will save some (or all) of that for another day. adieu.